The PlayStation 4 is getting external hard drive support in the next system update. May add higher frame rates or shorten load times. 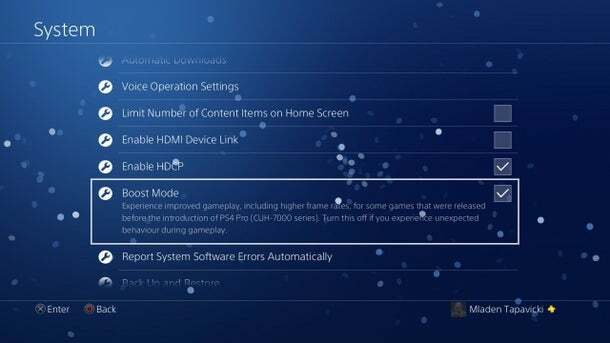 "Boost Mode lets PS4 Pro run at a higher GPU and CPU clock speed for smoother gameplay on some PS4 games that were released before the launch of PS4 Pro (and has not been updated to support PS4 Pro). ...It appears the mode may not work with every game flawlessly, as users are told to turn the feature off in the event there is any "unexpected behavior during gameplay." According to reports from those who've had hands-on time with "Boost Mode," the new system setting will only provide a performance increase for games that don't have locked frame rates. For a look at the performance boost this new feature will reportedly provide, check out this comparison video from YouTube user Noel Underson that offers a look at The Evil Within running with and without Boost Mode. that is cool that ps4 supports external hdd storage for games and such. and for ps4 pro owners, the boost mode can make older ps4 games runs at a higher frame rate and possibly faster loading time. this is for older ps4 games that weren't optimized for the ps4 pro in the first place. cool.